The first two Windows Phone devices Nokia announced late last year, the Lumia 710 and 800, looked like decent but unexciting phones. The phones were also missing a couple of feature checkboxes including a front-facing camera, NFC and LTE. 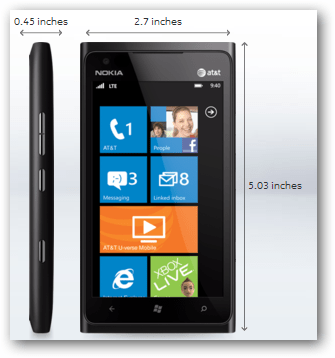 The first 2012 Lumia model is the 900. How does it fare spec checkbox-wise? It is still missing a couple of features, however. It remains to be seen if the 900’s camera matches the spectacular quality of past Nokia (non-Windows Phone based) smartphones or is the so-so quality seen produced by the 710 and 800. Nokia N97 + Neurosky Bio-sensor + Maze Game = ? But, I can’t see I see any “mind control” involved after watching the video demo. All the navigation is done through hand motion. The mind control part is supposed to be “thinking in advance” of the course. But, that is not something readily apparent just by watching a video. I’ve noticed small quirky annoying problems with the Nokia N96 since I updated its firmware around May (if memory serves me correctly). The N96 couldn’t “remember” my voice mail number (123) after repeatedly entering it and seeing a message saying it was stored. Camera would not attach GPS geotags to photos even though I repeatedly set it to on in the camera app’s settings. The N96 also seemed to lose its Bluetooth connection to devices that had worked spectacularly well with it for months. On a whim I checked to see if a new firmware release was available for it today and installed version 30.033 dated June 18, 2009. So far it looks like the voicemail number setting is sticking. I thought the camera’s GPS setting was too. But, a quick just a moment ago showed it had reverted back to off in the past hour. I didn’t notice any Bluetooth drop to a BT car speaker. But, that problem only showed up a couple of times a week (not daily). I spoke with Nokia’s Ira Frimere (Portfolio Manager for North America) and Joseph Gallo (Communications Specialist) about Nokia smartphones (what else?) in this podcast. ZDNet/NokiaExpert.com’s Matt Miller was scheduled to join us but was unable to because of technical issues. However, the Nokia USA site says it is only available for pre-order and not actually shipping. Since it does not appear to have a US Carrier associated with it, it currently only available at its full $529 price. The E75 is based on Symbian S60 3rd Edition Feature Pack 2. Its slide-out keyboard looks like a good one. It also includes a 3.2 megapixel camera (with zoom and flash) as well as Assisted-GPS (A-GPS). It has Bluetooth and WiFi (802.11b/g) and provides the ability to serve as a wireless data modem to a tethered device (Nokia PC Internet Access).